Winning in the breeze on their own home Costa Smeralda, Sardinia waters, showcasing that heady cocktail of tough Argentinian gaucho spirit and fiery Italian passion that underpin their never say die team spirit, capped a remarkable Settimana delle Bocche regatta week for Azzurra, the Roemmers family team which races for the Yacht Club Costa Smeralda. Skippered by Guillermo Parada (ARG) with ebullient Italian tactician Vasco Vascotto calling shots and owner Alberto Roemmers Jr (ARG) sharing the helming duties, Azzurra won the final windy race of the Settimana delle Bocche with nearest rivals Quantum Racing in sixth to clinch the second regatta of the 2015 52 Super Series and take the overall circuit lead. It is the second time in four years that Azzurra have won on their own home turf, adding to their 2013 triumph at this regatta. 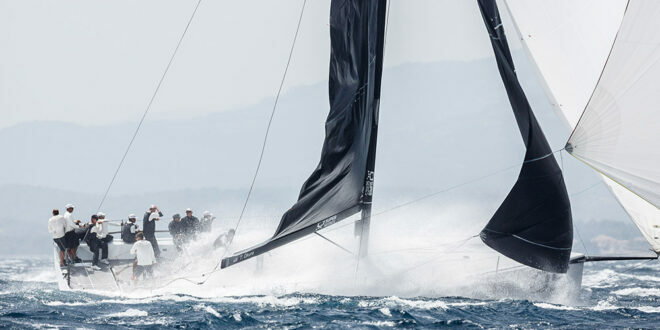 Azzurra’s winning scoreline included three victories on the windward-leeward courses, pipping the 2014 series and world champions Quantum Racing by four points in the regatta standings. Russian flagged team Bronenosec won both coastal races and one windward leeward but bookended an otherwise impressive set of scores with ninth places in the first and last races. They take third on countback ahead of Ergin Imre’s quietly consistent Provezza team. Second for Doug DeVos, who had not steered his TP52 for 18 months, since winning Key West in 2014, is an excellent result. He will be back to helm at the Copa del Rey but Ed Baird will steer for the TP52 World Championships Puerto Portals, Mallorca next month when Valencia champions Rán Racing return to the fleet.